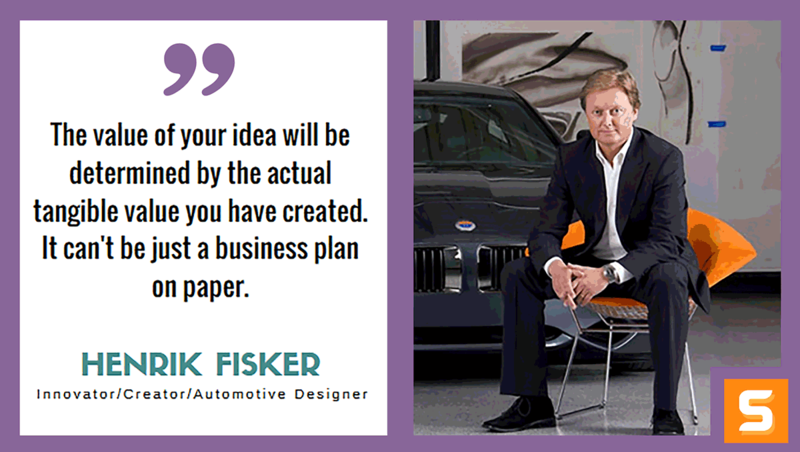 Henrik Fisker is an entrepreneur, creator, innovator, mentor, brand ambassador and leading automotive designer. Henrik is the founding partner and head of design and product strategy at VLF Automotive, an American luxury sports car company. He is also the founder and CEO of HF Design, involved in various automotive ventures, consumer products ranging from lifestyle, homeware, education, smart devices and technology ventures. In this interview, Henrik shares where his true roots as an entrepreneur come from and his secret sauce to success is to never stop being curious. When you are done absorbing Henrik's entrepreneurial ideas, be sure to to give him a shoutout on Twitter! What ignited the spark in you to start a business? Where did the idea come from? My father was an entrepreneur. It was part of my upbringing sometimes to not have any pocket money at the end of the month. But my father always had exciting stories to tell from his business experiences that were engaging and exciting. These stories inspired me to become an entrepreneur and start a business to bring my ideas to market. Finding creative and like-minded people, doing things without compromise and getting things done efficiently! How do you generate new ideas for your business to keep growing? Is there a secret that you have figured out over the years? I think, I have a curious mind that feeds my creative itch. I always have more ideas than I have time to execute. The only secret to growing a business is to never stop being curious, keep learning, surround yourself with talented people and do not be scared to open unexplored doors. You have to communicate your entrepreneurial story and create an emotional connection with your customer. Most people do not take into consideration the emotional reasons for a consumer to buy a product, brand or service, whatever your business is. Most entrepreneurs do not spend time reviewing and refining the emotional connection between their product and the consumer, leaving room for competitors to sweep the customer base or not integrating with the consumer fully. If you are an entrepreneur, you take risks everyday and you always have to be prepared for unforeseen circumstances. As you grow a business, you develop a greater relationship with your co-workers and become an extended family. I recently lost one of my former engineers to cancer, and I fear loosing my family and co-workers to bad health. I encourage everyone around me to stay happy and healthy. I workout everyday and eat healthy. Who has been your greatest influencer along your entrepreneurial journey? How did they shape your business? My wife, Geeta. She has a PhD in Biotechnology from the University of Cambridge in UK, and is a very successful investor and business-woman. Geeta has greatly influenced me into not just being a perfectionist about the creative outcomes, but also the financial and business outcomes. Most entrepreneurs are so emotionally excited about their idea, that they are afraid to look at all the aspects of the business and where to take tough decisions. All entrepreneurs have some things in common at varying degrees - they take personal risks, go against the odds, have disruptive ideas and can lead and motivate a team. I tend to go with my gut feeling and have the ability to deal with unique situations and take immediate decisions. I am a positive thinker with the glass not just half full, but pouring with ideas and positivity. I like a happy, healthy and motivated team, and if they are not there, I do everything to get them there. Have you faced any failures with any of your business? How did you overcome it? No entrepreneur or creator can create a successful business or products without taking risk. A risk does not have a guaranteed or known outcome, but with experience and the right ingredients, one can take calculated risks. In a traditional sense, an entrepreneur has to fail to succeed, otherwise they did not take enough risks. Failure can be on a small scale, that gets refined to reach success, or sometimes on a larger scale, where one looses a business. No matter what the scale of failure in a traditional sense, one should be able to learn and keep evolving and innovating. My entire career has been about taking risks, evolving, refining and keep moving on to create better businesses and greater products. Best Advice: Always be prepared to walk away from a deal. It's the best negotiation skill. The Worst: It's better to own a small share of business that will become huge, that own a lot of nothing: Most used sentence by investors to make an entrepreneur give up his equity in a financing round. Partners should always be aligned in a business. What advice would you give to aspiring entrepreneurs in California who have a business idea but don’t know where to get started? Be bold, think about disruption. Create a business plan, set up a company, listen to input from people, find partners and move your idea as far as you can, create value, before you look for investments. The value of your idea will be determined by the actual tangible value you have created. It can't be just a business plan on paper. Keep innovating and keep evolving. Don't be scared. Have a great life partner who can share your passion, risks and keep lifting you up, when you are down.